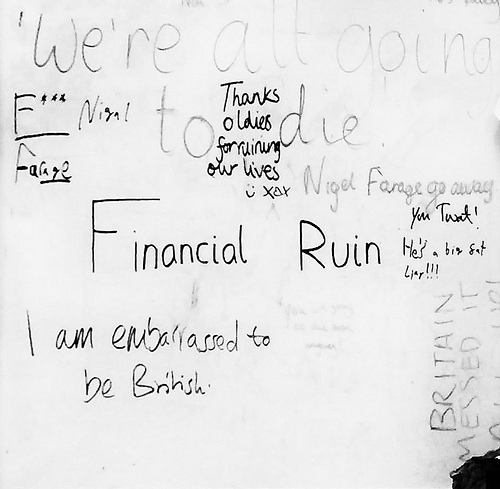 The image above is what was written on my daughters’ school whiteboard today, showing the reaction of our kids to the referendum vote to leave the EU. With the EU referendum resulting in the narrowest possible result in favour of Brexit I’m still coming to terms with the shallowness of the voters. The result has left me angry and disappointed. Rather than half the people of the UK being in the EU reluctantly, the other half will now be dragged out against their will. All of Scotland voted to stay in Europe but will be forced out. This all started as an internal division within the Conservative party rather than as a grass roots aspiration for independence such as the one I am familiar with growing-up in Scotland. When politicians talk about the ‘People’ they don’t mean you and me; they are talking about fellow politicians. The UK government will now surely move even further to the right as the cabinet reflects the success of the leave campaign. Labour completely failed to mobilise its natural supporters in the ‘working class’ and Corbyn appears to be ambivalent on Europe and the outcome of the vote. Now our older voters have overridden the views of the generation that will follow them. So now we have a weakened and divided Conservative party. We have a weakened and divided Labour party. We have a divided UK and a nation that has voted against unity and in favour of more division within Europe. As a nation we have lost sight of the fact that being part of a more united Europe is the ​right​ thing to do and focused on narrow parochial issues.